Learning Portuguese is usually comprised of courses where you learn basic grammar rules as well as complicated language notions. 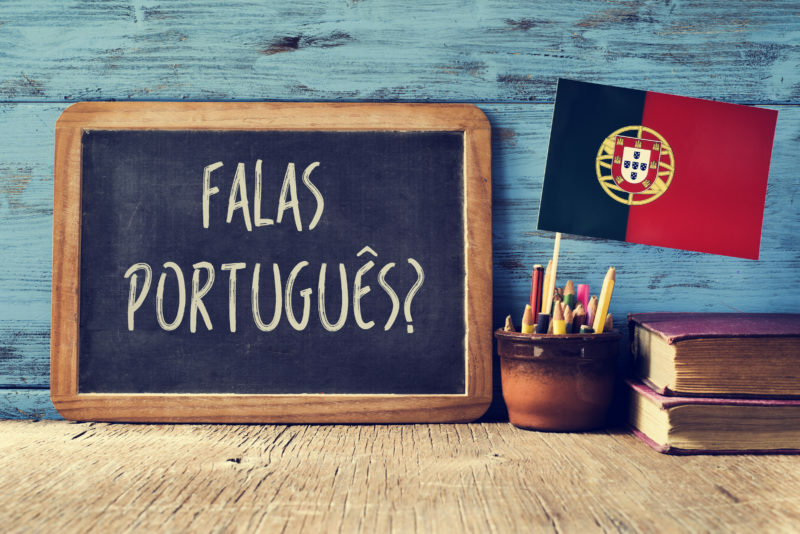 While this is one option, there are other ways in which you can learn how to speak the Portuguese language. Most people want to learn the language quickly so that they can engage in conversations with others. One way to achieve this goal is by having real conversations as you learn Portuguese. There are even some educational software applications that allow you to engage is Portuguese conversations immediately. As it relates to how to learn to talk in Portuguese, Linguists believe that the best way is by listening to people who are native Portuguese speakers engage in conversations in a natural setting, as opposed to a classroom setting or any other type of learning environment. Listening to others speak Portuguese is essential because of the way in which our brains are wired. You tend to absorb the information that you hear, which means you are likely to absorb the Portuguese language as you hear others speak. This is why listening to people speak Portuguese is an important part of the learning process. You’ll be able to pick up on the correct pronunciation of words by repeatedly hearing them spoken. After you’ve had a chance to listen to others speak Portuguese, an important part of the process is practicing what you have heard by actually speaking the language. In order to avoid losing what you’ve learned, it’s a good idea to get started right away. Instead of having to find someone who speaks Portuguese or travel to a country where Portuguese is spoken, there are software applications that can be used to help you engage in conversations with native Portuguese voices. These programs are often intuitive and ask you questions to which you respond in Portuguese. The programs then interpret what you’ve said and offer an appropriate response. You are essentially engaging in a conversation with a native Portuguese voice that understands and replies to your answers. It’s a method of learning Portuguese that’s used by millions of people around the world, who at some point wondered how to learn to talk in Portuguese. One of the ways in which how to learn to speak Portuguese has advanced is through the use of virtual reality programs. It’s both the present and the future of learning language because of the potential if offers as it relates to experiencing what’s closest to a real life conversation. Virtual reality programs typically help you speak Portuguese by using headsets to immerse yourself into the language. These virtual reality headsets not only allow you to hear someone speak the language, but they virtually transport you to locations around the world where Portuguese is spoken, allowing you to have conversations with native speakers. You might find yourself in São Paulo or Rio de Janeiro engaging with the locals. This is the kind of experience that not only makes learning the language exciting, but it also makes it easier because it allows you to absorb the language phonetically. One of the best aspects of using a virtual reality system is that it eliminates the anxiety that people tend to feel when learning a new language. This anxiety is usually caused by fear of sounding ridiculous or using the wrong words. Virtual reality programs allow you to practice and take your time finding the words and phrases required to engage in a conversation. You can take as much time as you need to figure out how to respond to someone. The best part is that you can do all of this from the comfort of your home. It takes some people longer than others to learn, so you can go at your own pace until you feel confident enough to engage in a conversation with real people. Virtual reality is one of the most effectively ways to learning how to speak Portuguese because you can engage in conversations with as many people has possible, and you hear the proper pronunciations from native voices. As the third most widespread European language around the world, Portuguese is spoken by approximately 250 million people spanning across 4 continents, including Brazil and Portugal. There are also millions of people who speak Portuguese in Angola and Mozambique. There’s even an area in East Asia called Macau where Portuguese is considered the official language. This is the case because that area of Asia was once a Portuguese territory. When it comes to speaking the language, you’ll find that Portuguese language is both soothing and quite romantic, much like Spanish, French and Italian. It’s origin is the Iberian Peninsula approximately 2000 years ago when Portugal discovered South America, which is where the Portuguese colonized Brazil, the largest Portuguese speaking country in the world. Given this background, it goes without saying that learning the Portuguese language can be beneficial when traveling to any Portuguese speaking country, despite slight differences in grammar and how words are pronounced. Upon learning Portuguese, you will be capable of communicating with more than 260 million people who speak Portuguese, including the people that you encounter upon visiting Brazil or Portugal. The enjoyment of your travels will definitely increase when you know how to speak the language. Being able to have conversations in Portuguese will facilitate a more authentic experience during your engagement with the natives. Beyond how to learn to speak Portuguese, there are professional reasons why you should invest the time required to learn the language. Depending on your career, you might have access to more professional opportunities if you’re bilingual, since many companies are international. There are even companies that prefer Portuguese speaking candidates when they have business ventures in Portuguese speaking countries. If you are already employed, there’s a greater possibility of receiving a promotion if you’re able to travel to Portuguese speaking countries and communicate with business contacts. This is a significant financial benefit of learning how to speak Brazilian Portuguese . There have also been studies showing that learning a second language improves the functioning of your brain. Specifically, it improves memory, concentration and intelligence by giving your brain a workout. There have even been studies showing that learning a second language decreases Alzheimer’s and dementia. This means learning to speak Portuguese has far-reaching benefits of immeasurable value. Simply put, learning how to speak Portuguese can actually make you smarter and healthier.